From steel sceptic to cold rolled convert. 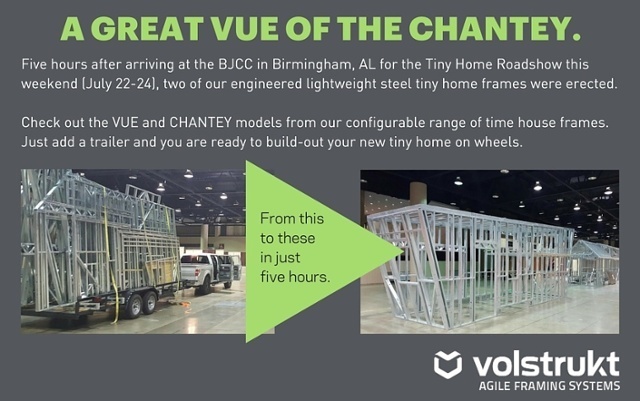 In July, the Vostrukt team took took two of our engineered lightweight steel frames to the Tiny House Roadshow in Birmingham, Alabama. The CHANTEY is a model from our Configurable Stock Models of pre-engineered tiny home frames. These events present a great opportunity to talk about, touch & feel and walk through the cold formed steel behind our framing systems. Volstrukt Co-Founder, Marc McQuain, travelled from Austin to evangalise the benefits of our cold rolled steel technology, and to explain how different this is from 'traditional' steel framing methods. The commercial builders have been the most challenging group to overcome apprehension toward considering steel framing as an alternate to timber in tiny house construction. 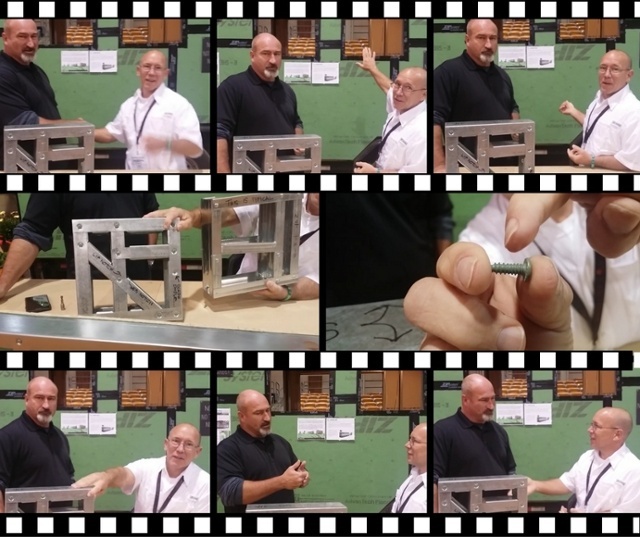 Volstrukt Co-Founder, Marc McQuain with Andrew Bennett of Trekker Trailers discussing the cold formed lightweight steel technology behind Volstrukt's range of tiny home frames. See the video here. Marc caught up with Andrew Bennett of Trekker Trailers at the Birmingham Roadshow. Andrew has been building his whole life, and was an early entrant into the tiny home movement. A self-confessed 'steel sceptic', by the time he had had a chance to learn about how well suited the cold formed design and production process is to tiny home construction, well, we now count Andrew as one of the growing band of 'colled rolled converts'. What won him over? Weight, precision, strength. The low production wastage and recylability. A first hand look at how the screws and fixings we use with the steel work, and ... price. We thank Andrew for capturing the moment for NOAHCerified.org and allowing us to share it with you. If you are interested in building on a lightweight steel frame engineered for tiny homes, get a brochure, get started or get in touch. In this blog we post our news, comings & goings, information on lightweight steel and how we, and others, use it to make residential and retail property more agile.